If you are looking for information on the BallStars franchise business opportunity, BallStar franchises or BallStars franchising, then you have come to the right place. Are you looking for a Home Based Business or Sports Based Business Opportunity? Do you want to sell a Fun, Unique and Tangible product? Do you want the Freedom to Work and Travel at the same time? Permanent or Mobile - system allows you the freedom to work from home, work while you travel or start your own retail store! Unique Marketability - coupled high value personalized products with the passion of sports! 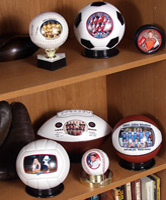 Simple production process creates one-of-a-kind keepsake photo and logo sports balls and ornaments! Exceptional Quality - images are virtually indestructible and all balls are premium grade synthetic leather! How long does it take to produce a single photo sports ball from beginning to end? If you snapped a digital photo, produced and printed the artwork and pressed the ball, it would take under 5 minutes. Is the system mobile enough to take on location? Yes, both models have been used in mobile applications. Some put them in trailers, some just re-crate the systems and take them to malls and events in a car or van. We provide in-house training once a quarter for anyone needing help. On-site training is available for customers who purchase the Pro package. Do I get an assigned territory? We do not assign protected territories nor do we limit your reach in any way. How long does it take to receive my equipment after I order? After the licensing agreement is signed and full payment has been received your order will ship within 48 hours. Where do I get the blank sports balls? You would buy all blank sports balls from BallStars. These balls are specially coated and manufactured for our process. You can purchase all your supplies from BallStars. We carry all supplies, in stock and ready to ship. What is the maximum imprint size? It differs per sports ball but can be as large as 7 1/2" x 4". What software is required to generate the artwork? We provide two kinds of software. One enables you to be productive immediately. The other allows you to explore your ideas and creativity. One version of graphics software we supply is called BallStars Designer Pro will run on PC operating systems versions Windows 95 and up and requires 1.4 GB of hard drive space. 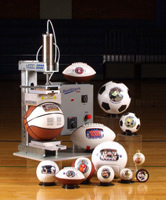 Besides Sports Balls, what other products can I produce with this system? Only the products manufactured by us specifically for this press can be produced. However, with only changing the type of transfer paper you use, the printer could be used to print mugs, t-shirts, mousepads, tiles and magnets etc... to name a few.